Hi-fidelity earplugs let you enjoy loud concerts without sacrificing sound quality. Filters built into the super low-profile plugs dial down volume by about 22 decibels across frequencies, equally from bass to treble. This brings the volume to a softer and safer level, while the sound quality remains crystal clear. You can chat and hear conversations with the earplugs in, too, which makes them a useful addition to any loud situation. Dimensions: 3.75" x 2" x 1"
My wife loves these earplugs. She has hypersensitive hearing and these allow her to enjoy noisy events. Best gift ever. I love these earplugs! I wanted something to muffle work noises, but still be able to hear if someone was talking to me. Great product! Finally found something that works to allow me to enjoy a concert with out my ears hurting. 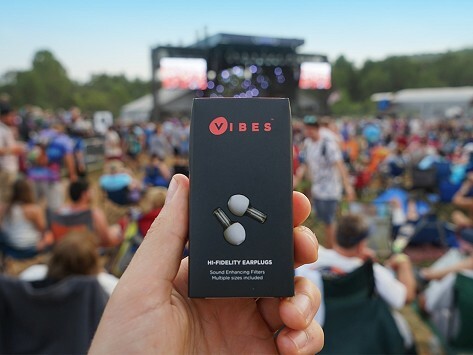 Vibes founder Jack Mann created hi-fidelity earplugs to help protect the hearing of his fellow live music lovers. When he experienced a ruptured eardrum at a concert, he was surprised to learn that a typical concert is loud enough to cause hearing damage. Vibes lower volume by about 22 decibels, putting sound levels into a safer listening range. Unlike typical earplugs, these don't block sound but filter it across all frequencies. This results in crystal clear sound quality that is softer and more comfortable. The earplugs are so discreet it’s easy to overlook them, and because you can carry on a normal conversation with a pair in, Vibes can be useful in any loud setting. After his injury, Jack developed a passion for hearing loss prevention. So Vibes partners with the non-profit Hear The World Foundation to help protect hearing around the world.